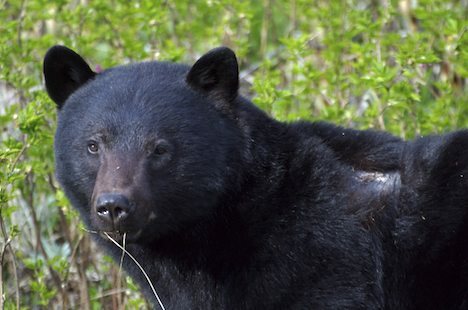 Known as the American Black Bear or simply black bear, Ursus americanus is the scientific name for this species of bear no matter what the common name is. They are the most common bear species in North America ranging from Canada (all provinces except PEI), and 41 of the US states including Alaska. Black Bear, Ursus americanus, on the side of the road near Port Hardy, Northern Vancouver Island, British Columbia, Canada. Picture of a large black bear, Ursus americanus, grazing on grass on Northern Vancouver Island.